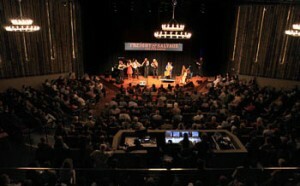 The Freight & Salvage has hit one out of the park with their new facility which provides a showcase for $13M well spent. Upgrades over its old facility are abundant, one being location which is in downtown Berkeley instead of the San Pablo Avenue corridor. This makes it accessible to BART which helps the transportation problem, and places scores of restaurants within walking distance which helps the dinner-and-a-show problem. Doors open into a spacious, welcoming lobby which in turn leads to the auditorium; and an auditorium is something the old facility was never meant to be. It had been cobbled together inside of a soulless rectangular structure that might have been a freight forwarding warehouse in it’s original life. The new facility is built for shows as it features side walls that slope inward toward the stage and seating that rises away from it. The photo above shows the audience sitting right up to the stage but the front rows, which are on the flat portion of the floor, can be removed for lower drawing performances or dance-friendly shows. As for the seats themselves, the narrow back-breakers of old have been replaced by wide, well-cushioned, tush-friendly furnishings. Lighting has improved from “maybe” to top-notch and the sound could well be the best of any room in the Bay Area. Hicks with Sticks walked the auditorium from corner to corner and front to back, and found the volume and mix consistent in every part of the room with not an echo to be heard. And what a relief to find that show prices have remained the same at about $15-20 per, which is a bargain in the alcohol-free Freight considering what a similar event at a club would cost once the door and bar tabs have been settled. Access, comfort, quality and value are four solid reasons to get to the new Freight & Salvage. Not having to walk by the side of the stage in view of the entire audience to get to the bathrooms, as it was in the old facility, runs a solid fifth. The big ol’ western swing band Lost Weekend seemed like a perfect fit for the new Freight. Find their “Six Pack to Go” from that night here.